Monday through Friday 7:30 a.m.- 6 p.m. and Saturdays 10 a.m.-2 p.m.
Paul Bunyan Communications offers phone, Internet, and television services to rural areas of Park Rapids, Two Inlets, Emmaville, Lake George, Laporte, Becida, Itasca State Park, and Bemidji. Utilizing the latest in fiber optic technology, members of Paul Bunyan Communications can provide a multitude of phone and television services, along with ultra fast high speed Internet with both upload/download speeds up to 100 Mbps. Other services including business phone systems, web page development and design, website hosting, and Paul Bunyan Long Distance. 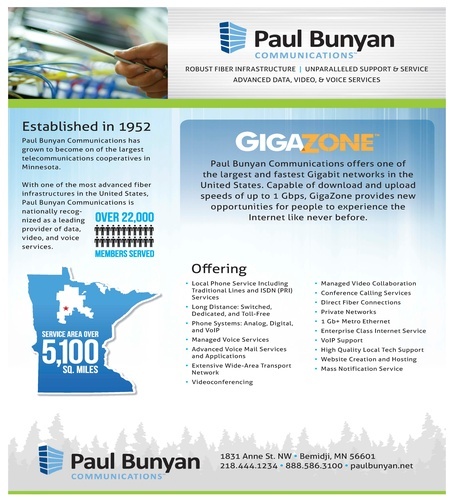 Having served Northern Minnesota since 1952, Paul Bunyan Communications is experienced in handling the largest business accounts in the region including Sanford Health, Bemidji State University, Beltrami County, and many more. Owned by the members we serve, Paul Bunyan Communications provides real local customer service, not some call center hundreds of miles away. All of our staff of over 120 employees live and work right here.